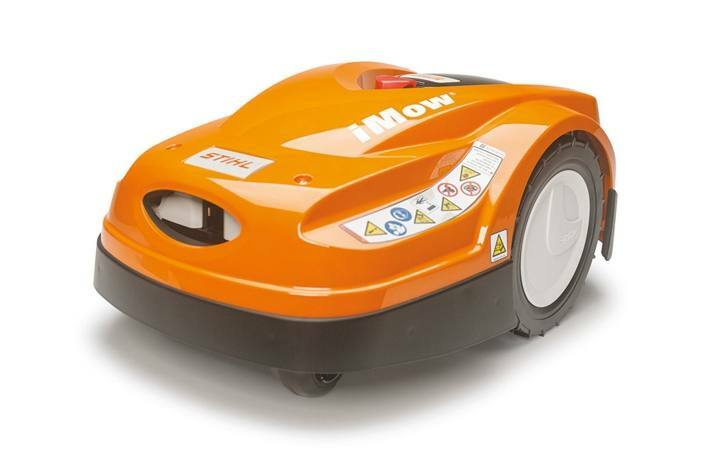 The iMow® robotic mowers independently ensure a perfectly cut lawn. And they do so extremely rapidly. Equipped with a powerful battery, the RMI 422 P can handle lawns up to 1000 m² (0.25 acre) and gradients up to 40 percent. iMow® is available in limited regions of Canada and sold and serviced at specially trained and authorized Dealers. Use the STIHL Dealer Locator to find your nearest iMow® Dealer. Featured price does not include installation. Mulching mower: When mowing, the lawn is cut finely and puts nutrients back into the soil. The robust mulching blade will stay extremely sharp for a long time. Every time blade stops the rotation direction changes automatically, thus ensuring uniform wear . If the blade needs to be replaced, this can be done without tools. Docking station: If it rains or the batteries run empty, the robotic mower goes to the docking station and recharges its batteries independently. With its intelligent charging system, the robot mower decides independently whether an express charge is needed, due to an upcoming mow, or whether the battery should be charged in normal mode - and thus more gently. The docking station can be flexibly placed, either within or outside the lawn area. Please observe the additional specifications for laying the perimeter wire.